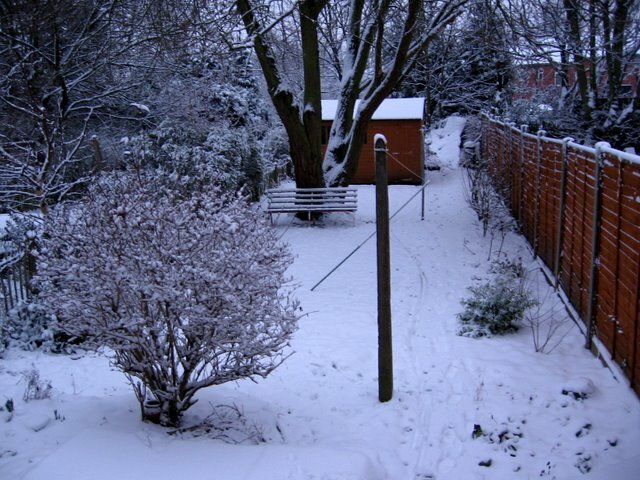 As I near the end of a week which has been dominated by the weather, I thought I'd post the obligatory picture of our garden buried under a respectable amount of snow. The last time I posted a picture like this was nearly two years ago and if you compare the two photographs, taken from the same spot, they do look remarkably similar! Snow has been the focus of pretty much everything this week as the white stuff has been falling on and off since Sunday. Things have kept going, until today that is when the local Councils started to run out of Grit, which means they've taken to rationing it. Coventry's council and the highways agency still have grit, but they're prioritising which roads to treat. This morning, none of the side roads had been treated, or at least none of the ones I drove over had been. Fortunately, most people seemed to have stayed at home - as evidenced at work by the number of empty desks, closed cafes, nursery and cancelled lectures on campus today - so the traffic was light, but if it hadn't been, I dread to think how bad the roads would have been. Still, I made it in to work. Albeit very slowly and tentatively, all the while warily watching out for children dicing with death as they sledged on plastic sheeting down the slippery, ice/snow covered roads I was trying to drive over. Hopefully, things will be a bit clearer come the time for the journey home tonight. I shall be watching the forecast closely. Those shrubs are in slightly different positions! Indeed. More shrubbery and less cardboard boxes. Still can't beleive the kids with death wish sledging in the roads. We stayed at home and sledged down safe banks in the park (photos on blog) not the road but as a kid I might have done something similar though in a more rural setting..